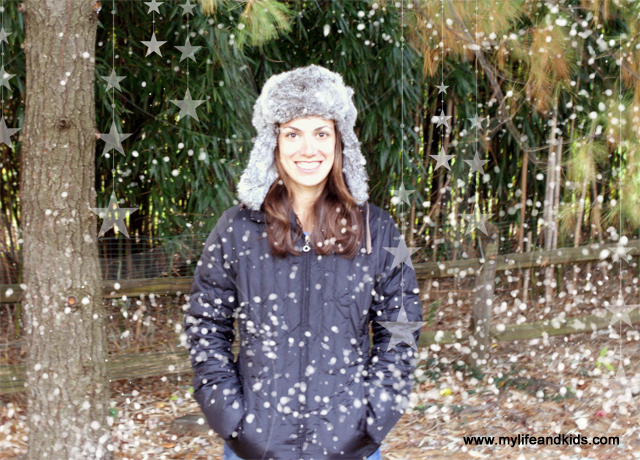 Hi, my name is Anna, and I blog at My Life and Kids. I’m thrilled to be visiting with at House of Hepworths today! I had three kids in three years and whew has my life changed! Just a few years ago I had a job I loved, a house in the city and a social life. Now I stay home with my three kids, I live in the suburbs, I wear mom jeans AND – I drive a minivan! In my spare time, I blog about it all at My Life and Kids. After a long, hot summer – I’m more than ready to cozy up my house and snuggle in for the winter. And when the holidays come around, I like to have a little bit of holiday in every room. Well – actually – a LOT of holiday in every room. 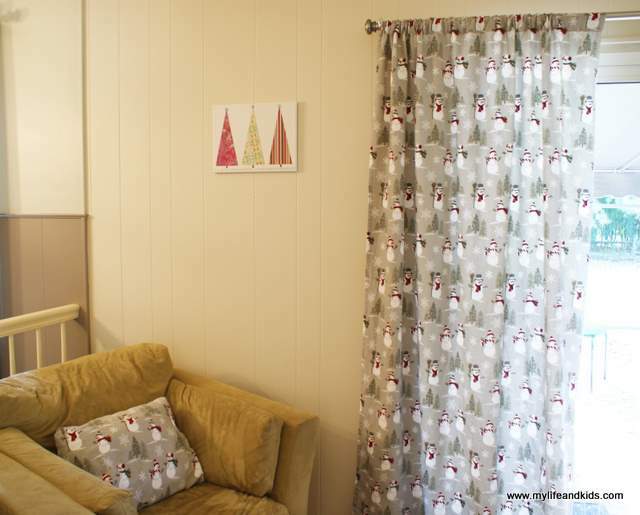 This year, I even made curtains out of flannel sheets! Here’s how you can too. 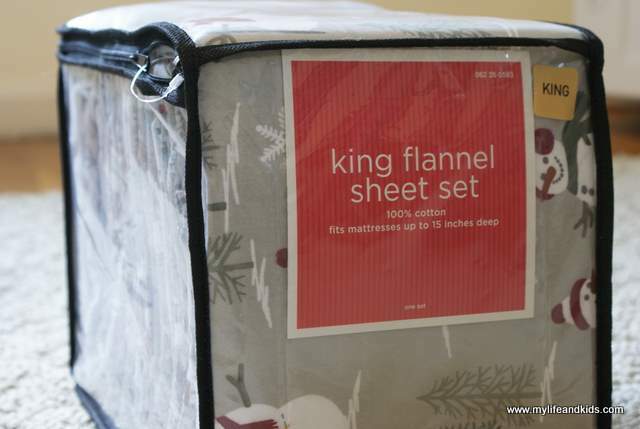 First, I bought a set of king flannel sheets. This is enough to make panel curtains for two windows (four panels total). I found mine on sale at Target for $24.99, and I had a $5 off coupon. That ends up being roughly $5 per panel – or $10 per window for curtains. Not too bad if you ask me! Now – I will be the first to tell you that I am NOT a seamstress. I can sew a straight(ish) stitch, and that’s about it. But that’s all you need to make these curtains. 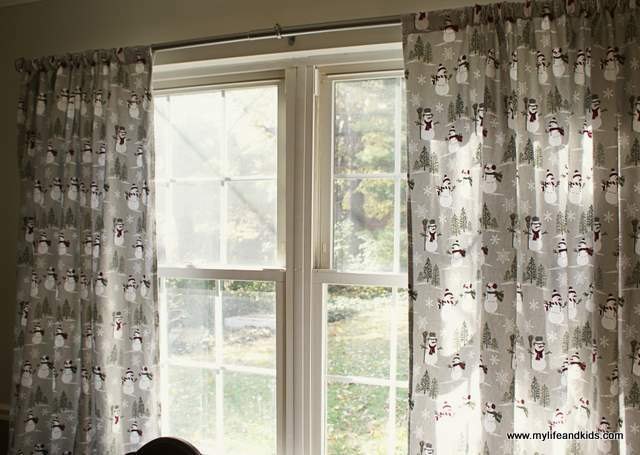 I’ll outline the basic instructions below – and you can click here for step-by-step instructions (including pictures) on how to make curtains out of sheets. First – I washed the sheets to get all of the wrinkles out. So much easier than ironing, don’t you think? Then, I cut the flat sheet in half – right up the middle to create two panels with the pocket at the top. I opened the top pocket on both panels so that I could slip my rod through it (how easy is that!?) Then I sewed a straight stitch on the cut edges to make it look a little nicer – but I’m sure you could use Liquid Stitch for this and skip the sewing altogether. I hung them on the rod, and then I used iron-on hem tape to hem the bottom (because I’m lazy like that). They are very fun and festive in my dining room! For the fitted sheet, I cut all around the edges to remove the elastic “fitted” part. Then I sewed a small hem on three sides (the top and both sides) to clean up the edges. I folded down the top and sewed a pocket for my rod. THEN I cut it right up the middle to make two panels and sewed a straight hem on those edges as well. I hung them on my curtain rod and used iron-on hem tape to hem the bottom (because I’m lazy like that). And then I used the pillowcases to make a few covers for my throw pillows – why not, right? They are very fun and festive in the family room! That is such a smart idea. They look great, too. I loooooove this!!! I am gonna look for curtains tomorrow!!! Thanks so much for having me “visit”, Allison! So exciting! Thanks Patricia! It does make everything feel so festive! first test message on Tuesday morning from new blog.